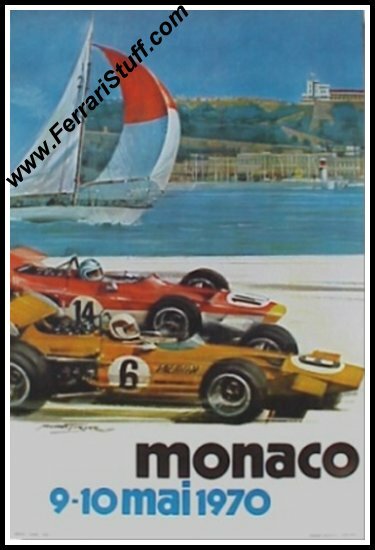 Original 1970 Monaco Grand Prix Race Poster for the race weekend of May 9 and May 10, 1970. As usual, the posters shows an image from the previous year, 1969, in this case the # 6 Brabham-Ford of Jackie Ickx battling it out with the Lotus-Ford of Graham Hill who would go on to win the race. In 1970, Jacky Ickx was the only Ferrari driver in this race and he had to retire his Ferrari 312B in lap 11, while in 5th position, with halfshaft trouble. The race was won by Jochen Rindt in his Lotus 49C. This poster will be shipped, rolled, in a sturdy tube.